Today's Snack: Since we're learning about quick and cheap ways to get sheet music, try a SHEET of fruit leather with a nice glass of ice water. It's really fun to teach yourself how to play a musical instrument. A lot of kids have learned how to play the piano and the guitar with very little paid instruction. Of course, you'll get a better start if you pay a professional to instruct you in the basics. If money is tight, one thing to think about is to arrange a group lesson with a piano or guitar instructor for three or four friends. You can split the cost of the lessons over the course of six weeks or so. Kids can use an inexpensive keyboard at home to practice. ����������� Making music is just a ton more fun when you get to select the songs you're going to play. But it's a hassle to drive all the way to a music store, and then even if they do have the song you're looking for, it might be in a big book of songs. You have to buy the whole book just to get that one song. Bleccchhh! ����������� With this online service, you can download your particular song and print it out - instantly available! 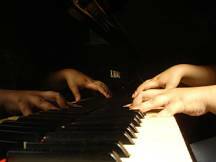 Most of the music come in various levels of difficulty and different keys and chord settings. ����������� It's really fun to use the latest technology to learn to play some of the oldest technology invented by man - musical instruments!